Death Wish 4: The Crackdown is about a man who is seeking revenge on those who lead to the dimise of his loving girlfriend's daughter. In this movie a man by the name of Paul Kersey falls in love with a woman and her beautiful daughter Karen. Unfortunately, Karen gets sucked into the world of drugs and ultimately dies from an overdose of crack cocaine. After Karen's death, Paul decides to find out who supplied Karen with the drugs and serve up his own style of vigilante justice. 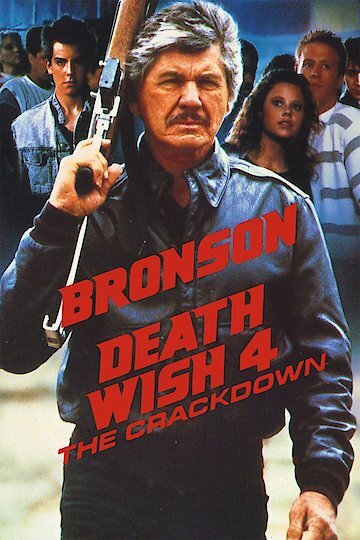 Death Wish 4: The Crackdown is currently available to watch and stream, download, buy, rent on demand at Amazon Prime, Starz, Amazon, Vudu, Google Play, FandangoNow, iTunes, YouTube VOD online.